It's the end of January. The only thing worse is the beginning of February. Lord get me thru February, the worst month of the year. It is just so cold, snowy, wet and raw and undriveable. It makes one housebound. From the living room picture window we watch our Road Agent, Emmett Bean, go by in the town plow, keeping us able to get out of our wintery nest. We stay in. We hunker down. We wave to Emmet as he goes buy. We cook. We bake. We read and do all sorts of things requiring little movement and even less excitement. I sew as I can fit it in. As much as I love to sew wools, this depressing time of year, give me some great linen. This annual request has been answered nicely. At this time of year a piece of beautiful linen is so good for the soul. It reeks of lightness, warm memories, summery days and swishing, dry, comfortable fabric around one's dark legs. Sometimes linen can be a topper, a big, loose Tiltonesque tunic that lets any breeze blow through. Or linen can be pleated shorts, the type that are almost triangle in shape, never letting a bit of summer heat alter their comfort level. Do you remember when linen was a tailored blazer, pressed to perfection, that arrived at work or some other event, looking so horribly wrinkly that you just died of embarrassment? But it was linen, in my best whiney voice. Tailored linen pants would make horrid crotch wrinkles, baked in by the morning work commute, so awful. I used to be on my feet almost all day with my former career. I would carefully hang my linen trousers in my air conditioned car and drive to work in a pair of PJs, seriously. I would get there way before I needed to, put on my perfectly pressed linen pants and not sit down until later in the day. My linen trousers would manage to look maahhvalous for most of the day and they were so comfortable to wear. Alas, that time of my life has ended and I have moved on to other linen endeavors, somewhat less based on my vanity. I have found more linen, beautiful linen, in thrift shops. I glean it from the larger women's sizes and it usually can be found in full skirts, pants and suits. The skirt above is clamped in back to keep it up on the form but is a size 18. I can often manage enough for most any garment I want to make for myself. This could mean taking a suit jacket apart but for the price of great linen, what the hay? At the huge Goodwill I am lucky enough to live near, I recently found an Evan Picone skirt that I would say at most was mid sixties vintage. The cross dyed plaid linen is exquisite and in my favorite colors, a bit of black, some white and a water colored aqua. The deep knife pleats held a huge amount of fabric. The skirt went to the floor on me, hemmed, and was over three yards in length. I remember having a legitimate excuse for not having this ironed for the photos but here it is. After the pics, it was washed, the waistband removed and all the pleats easily pressed out with my Rowenta and a lot of steam. I've got a lot of fabric to work with here. I know, not pressed yet, but this is the back zip area. The zip on this is a beautiful installation. which I have recently found in an old Threads issue. In an article by Cecilia Podolak in issue #43 you will see the exact same type of zipper installation, hidden deeply behind the pleats and laying very very smoothly. With some ironing in my previous photo it would be entirely invisible. Those old Threads issues are priceless, BTW. This zip lays as smooth as possible and matches beautifully across the plaid on the exterior, very impressive. Not bad for my two dollar investment, don't you think? I bought our Maddy's Easter dress and coat fabric this week - although I'm sewing flannel for her Valentine's Day ensemble, can't wait to pull out the lavender microcheck and white pique. Lavender, ahhh, the color of spring itself! Sounds yummy! I think it's pretty as is and only needs to be sized down for you. But then that would mean hardly any work at all for you, and what's the fun in that? Good linen can be quite pricey now, especially those that come from Eastern Europe so your 2-dollar find is really a treasure. Happy sewing! Definitely longing for summer! Between the snow and the deep cold, school has been out since last Thursday. Beautiful linen, what an awesome find!!! You are in the thick of the polar vortex. We have had brutal temps here as well but today brings us back up to a February thaw, yay. I might get a walk in! 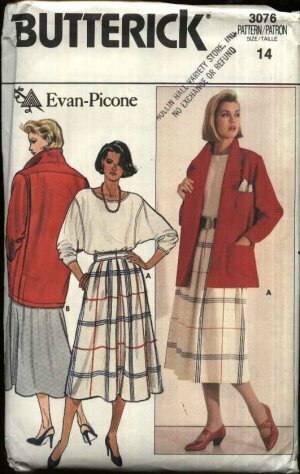 I used to have a pleated linen skirt very like that, in a different plaid. I loved it so much but the wrinkles! I wish I had that fabric now. Now I embrace them and stick with simple linen shapes that look good out of the dryer, without ironing. Love to see what you make. I love that washed, rumply linen look as well. It just says comfortable in a classy sort of way.